It’s great to be a freelancer. You are your own boss, you work from home. But with all that freedom, comes the challenge of finding your own projects. Here are 20 things I’ve learned in my 20+ years of experience as a web/print designer. Have a goal and target audience in mind. My goal is to work with a small number of clients and service them in as many ways as possible – website design, email and social media marketing, print, etc. Other designers may focus on one service – i.e. business card design, and may try to reach many clients. Some designers focus on one type of client, like healthcare, or authors. Who will you target? What is your overall goal? Check in periodically with past clients to see if they need anything. They are the most likely to hire you again. Show people what you do. Social media is a great place for this. People don’t always understand what you do. By posting your projects, you’re letting them know. And a blog is great way for people to get to know, not just your projects, but you. Learn – There is so much free information out there – youtube, udacity (html coding), the library – ebooks and audiobooks, blog posts, webinars, podcasts. Soak it all up! Follow up! People get busy and forget. Make it easy for them, by following up and putting your name and contact info in front of them. Practice your “elevator pitch” – how you can describe what you do to someone you meet for 2 minutes. Network – Take friends/acquaintances for coffee and ask for advice on how to grow your freelance business, types of companies you can target, etc. Asking for advice is easier than asking someone you know for business, but you may end up with a new project. Networking Groups – Join one – either local or online. There are mentoring and mastermind groups too. All of these groups expand your network. Try not to do stuff for free! If you do something for a reduced rate, have the client pay the difference by bartering, or by promoting you on their social media. Make sure you quantify it in your estimate (x # of posts). Working cheap will come back to haunt you when someone else quotes that discounted price. Expand your services. Be willing to do other, related things, for clients – manage social media, load products to their e-commerce site, etc. Keep a list of potential clients and continually add to it. Send them an email, cold call (gulp), mail a postcard, or send a FB message. Follow up a few weeks later. Don’t forget the “other” stuff. When you are freelancing all the other stuff is your job too – supplies, vendors, invoicing, following up with people who owe you money, marketing, etc. You won’t be just designing. All the overhead costs are yours too. Have a website with your portfolio and services. Include links in your email to your website and social media. Update your website to include new work. Talk to everyone, and learn what they do. Ask if they could use your services, or suggest they start “emailing clients” (or any service that you can “help” them with – for a fee of course). Mark up printing costs or anything from a vendor. I think standard is (or was) 30%, but I it also depends on the size of the job. If you don’t want to cover the vendor costs you can charge your “production” time and the client can pay the vendor directly. Work for others – even if it’s just part time. You can learn different skills about organizing a business, dealing with clients, etc. from different bosses, even within different industries. Seek out clients who can afford to pay you, that have the budget for the projects you can do for them. Although it’s kind of obvious, it took me a while to learn this lesson. You know the saying you can’t get blood from a stone? Plenty of people could use a website, or logo, or whatever, but if they don’t have the resources to pay you what you are worth, they aren’t your target audience and aren’t worth pursuing. Good luck! I’d love to hear from you! Have additional advice? Find this post helpful? Let me know. It’s a great time to reflect on past accomplishments, and set goals for the New Year. I think it’s important to take stock of how far you’ve come, and where you’re headed. This year, I’ve had the pleasure of developing several new relationships. I offer different services, so I’m always interested in what specific areas I worked in throughout the year. 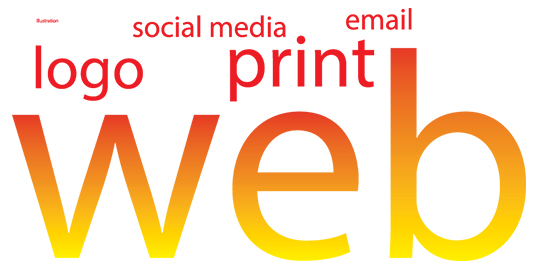 As the graphic below shows, web design was the largest part of my business, followed by print, then logo design. Social media and email marketing were tied. Illustration was the smalllest part of my business. I know web design will continue to be a large part of my business in 2016. New businesses need an online presence, and for many existing businesses it’s time to update their sites, especially if they aren’t mobile friendly. I predict that social media and email marketing will continue to grow, as they are important elements to any marketing strategy. What are your marketing goals for 2016? I’d love to connect with you in the new year and help you achieve your goals. Email Marketing is still important!